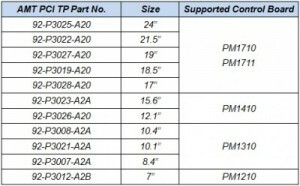 After completing the release of PenMount’s 3rd generation product line of projective capacitive (PCI or PCAP) touch control boards including the PM1210, PM1310, PM1410, PM1710 and PM1711 this year, AMT has continued to introduce a series of PCI touch panels to complement the advanced functions of these 3rd generation controllers. 01.Default sampling rates of 160 sps for single point touch and up to five touch points are available standard. 02.AMT touch solutions can be used in conjunction with numerous types of gloves. 03.AMT touch solutions support thick cover lens options. 04.Industrial EMC and medical EMC specs: AMT PCI touch solutions also offer advanced EMI immunity. For example, an AMT touch panel paired with a PenMount PM1710 control board conforms to IEC 60601-1-2 Edition 4.0 medical safety standards, can pass radiated RF immunity testing from 9V to 28V in a 385MHz to 6000MHz range, and is ready-to-use in medical systems. AMT PCI products have also obtained third party EMC certification, passing IEC 61000-4-3 radiated susceptibility testing level III and IEC 61000-4-6 conducted susceptibility level III. Level III refers to a testing standard of 10V. 05.Advanced water immunity features with a focus on no false touch signals when water is on the PCI surface: We have completed testing with different liquids. Saline (0.9% NaCl), blood (0.9% salinity), and not even saltwater (3.5% salinity) will cause false touch signals when present on the touch surface. At the same time, we have comprehensively determined the effect of other common liquids, solutions or solvents, and beverages on touch operation. AMT continues to supply the most reliable total touch solutions to the industrial, medical, and commercial fields with its 3rd generation PCI control boards and touch panels. If you have any special projects, please contact your sales representative and we will quickly apply the power of our cutting-edge products to your needs.